The kitchen is probably the most dangerous room in your house. It’s full of sharp objects, things your dog shouldn’t eat, hot liquids, etc. Your dog just wants to be part of the action but that can be risky for both you and your dog. It’s safest to keep your pet out of the kitchen while you are working in there. 1. So you don’t drop things on them – When your dog is at your feet in the kitchen, they are often looking up at you, making their eyes and face vulnerable to injury. I don’t have to go into the potentially horrific details but I am sure you don’t want to spill hot liquids on them, drop heavy things on them, or drop sharp objects on them. I know I’ve dropped knives several times and was just lucky that they didn’t fall where Chester or Gretel were standing. 2. 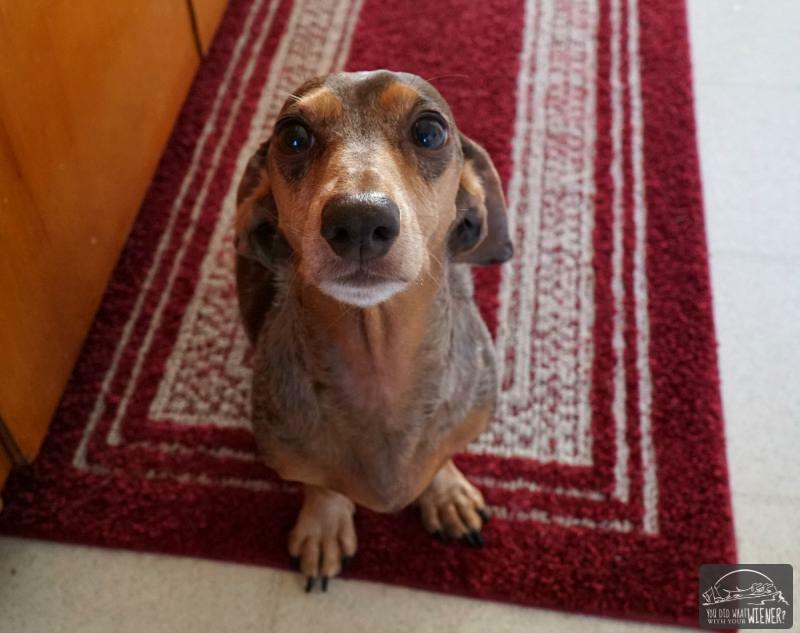 So you don’t step on, or trip over, them – Small dogs are especially at risk of injury in the kitchen by getting stepped on. While bruised and split paws are probably the most common injury, very small dogs could suffer back and neck injuries too. Even if you don’t step on them hard, their sharp “yip” might scare you and you might trip and fall trying to avoid them. I can’t count how many times I’ve stepped on Chester’s foot. Once, my weight even split his foot pad a little and made it bleed. I felt terrible. 3. So they don’t accidentally scarf up something poisonous – Most dog owners are aware of the food dangers in the kitchen – A dropped piece of dark chocolate or a macadamia nut could mean an urgent trip to the emergency vet. But what about other “edible” hazards? The kitchen is where I fill my weekly pill box with vitamins, supplements, and medications. One of my worst nightmares is dropping one of those things and making Chester or Gretel severely ill.
4. It teaches them that the kitchen is off limits when you’re in there – When you can close them out of the kitchen, they have no choice but to wait outside of the room until you are done and it’s safe to go in. Conversely, when they are underfoot and you drop something edible, it inadvertently rewards them for their behavior. Your dog learns that being underfoot sometimes pays off so they have no reason to stop doing it. In addition to shutting your dog out of the kitchen, it’s even better if you teach them that there’s someplace better to be. If your dog stands at the newly-established barrier grumping and barking (Chester. Ahem. ), consider giving them a stuffed treat toy in their crate or other room while the gate is shut. 5. It teaches them independence – I know, our dogs are family. We like that they loyally follow us from room to room. As cute as it may be at first, that can actually cause problems down the road. It’s important that a dog learn to be ok on their own – physically separated from you. Dogs that are too dependent on your presence are more likely to develop separation anxiety or start resource guarding their favorite human (growling or snapping when someone else comes close). Besides the points above – or related to all of them – is that gating your dog out of the kitchen when you’re cooking or cleaning gives you peace of mind. You can concentrate more on the recipe or task at hand instead of watching for your dog at all times. While training your dog to stay out of the kitchen on their own is ideal, that can be difficult. That’s especially true if they’ve been allowed in the kitchen for years…. Or if they’re a Dachshund! The easiest way to keep your dog out of the kitchen is with an indoor pet gate. Which Pet Gate Should You Choose? A pet gate should have a good mix of functionality and convenience. It needs to be sturdy and keep your pet contained, yet not be disruptive to your life and easy to set up. There are five main decision factors when selecting a pet gate. Do you want a semi-permanently mounted gate in the doorway or something you can slide completely out of the way when you don’t need it? How wide is the doorway or opening to your kitchen? How tall does the gate need to be – does your dog have a tendency to jump or climb? Is a gate you can step over ok or do you want it to have a door you can walk through? Do you want the gate to serve multiple functions and/or work in multiple doorways? Carlson Pet Products makes an indoor dog gate for almost every situation. 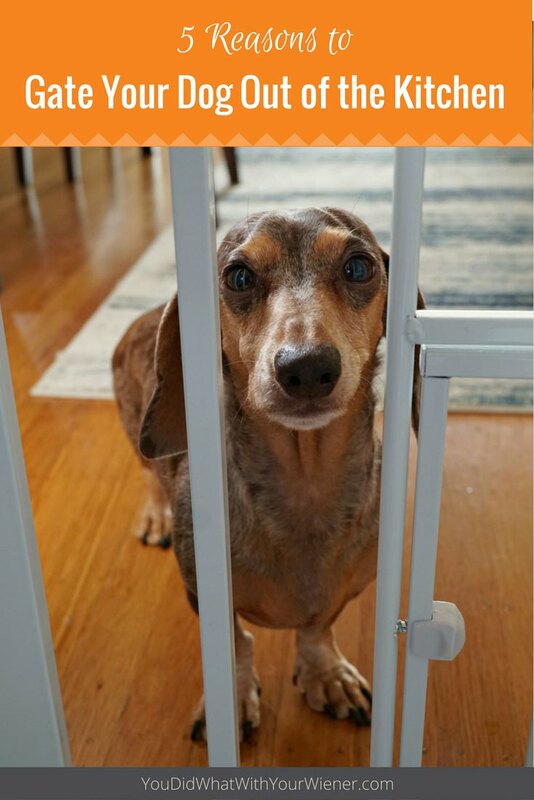 For example, if you want a gate that is expandable, requires no commitment or holes in your wall, and can be moved around the house, check out the 20″ Small Freestanding Pet Gate or the taller 28” version if your dog is a jumper. If you want an expandable pet gate that stays in your doorway but has a gate for easy access, they make walk-through pet gates to fit almost any sized doorway. If you want something that can work as a temporary gate or as a small pen, as well as a barrier to a room, look into the convertible pet yard. No matter which gate you choose, you’ll be happy you did. Every time I drop something in the kitchen or fill my pill dispenser I’ve thought about the risk I’m taking with Chester and Gretel at my feet. I finally installed an expandable gate for our kitchen doorway a few months ago and I have no idea why I waited so long! I’m so much more relaxed in the kitchen now. Is your dog allowed in the kitchen? If so, how do you make sure they stay safe? 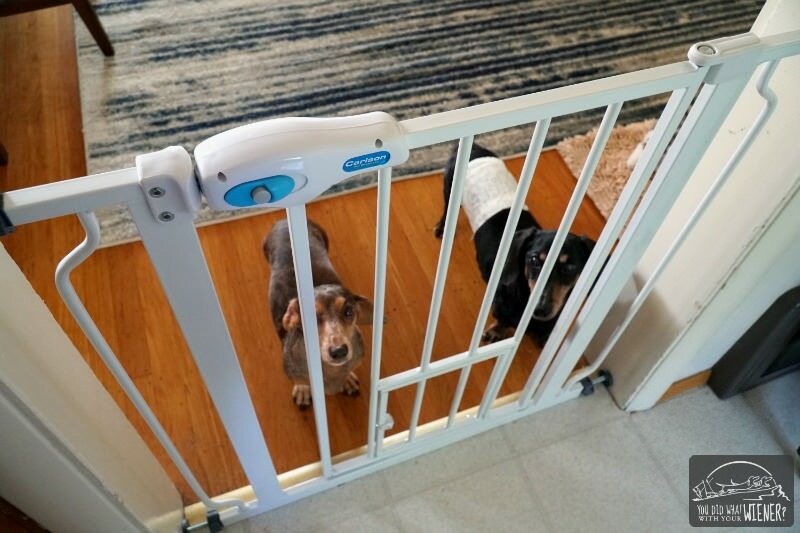 Disclosure: I received a pet gate from Carlson Pet Products in exchange for sharing with you why it’s important for me to block Chester and Gretel from the kitchen while I’m working in there. This did not influence my feelings about the product though. Boris had IVDD surgery on Aug. 28 and continues to be underfoot while I make dinner now that he’s finished his 6 weeks of crate rest. We have the stairs gated but you really got me thinking – going to gate off our kitchen too. Thank you! Sure. Sorry Boris and you have to deal with this disease. I’d just like to add that keeping our four legged buddies out of the kitchen isn’t just a matter of their safety but our own as well. It’s not just the possibility of triping over them that can endanger us and them alike. If you haven’t mastered obedience training yet they could start behaving on impulse, especially puppies, and start making a mess trying to get to some of the yummy treats that they can sense are being prepared. Having them jump all over us while we’re holding a bowl of boiling soup or removing a pot roast right from the oven can be quite stressfull and dangerous for all involved. You are absolutely right. I’m not sure why I waited so long to get a gate to keep the dogs out of the kitchen. Great read, my sister has 2 small dogs and they run free all over the house. I’ve been telling her to get a gate for awhile now, I’ll make sure she reads this. I am with you all the way!!! Dakota has never been permitted in the kitchen (except when we have company and the gate has to come down)……….my reasons were 1) We have a cat and Cody eats his food in there and since Cody was here first, I wanted to give him a safe haven away from Dakota and also to keep Dakota away from Cody’s food 2) Shetland Sheepdogs are larger than yours (but are only 25 lbs), but………they have TONS of LONG fur. I was paranoid that the fur would get near the oven if it were to be open My other reasons are the same as yours. I will check out those gates, I had received one less than a year ago from another company that has since broken. I am disappointed because it didn’t last a year! (I use a different gate for the kitchen) the gate I am mentioning was for the hallway which we also have gated. Dashchunds are so smart and will literally do anything for food! So, when we moved into a home with a small kitchen I started our two girls (5 & 4) waiting on the rug just outside of the kitchen. The treats made it worth their while and I waited a little longer in between treating each time so they weren’t overeating. Now, They are down to one treat and wait quite nicely for me. If they get excited or just “forget”, I simply point and they return to the carpet- yes, this took a few extra treats at first! Smart, happy dogs-safe kitchen! I have read many ways to keep a pup off the kitchen but I think pet gate is the best way we should try. Thank for your post! My girl has always been better about staying out of the kitchen. We don’t even really have to ask her anymore and she often waits at the edge of the dining room rug and watches us. Chester is stubborn and old and there is NO WAY he’s staying out of the kitchen without a gate. Ha, ha. I personally DO NOT like dogs that are constantly in the kitchen. Why? It’s simple, one word – fur. My Bernese Mountain Dog sheds like mad, and her fur gets EVERYWHERE. I agree that you really shouldn’t have a dog in the kitchen, otherwise you may be eating a couple pieces of fur by mistake! Ah… dogs.. and dog hair! I’m sure I’ve accidentally eaten a lot of dog hair over the last 15 years of owning a dog (and it would have been cat hair before that).